Essential Questions is a collection of more than twenty Conversation Guides designed to make conversations at work simple. The materials in the workbook can be used as a framework for better coaching discussions, as a training tool or within teams to encourage deeper thinking and improved problem solving. "A vital guide to coaching conversations at work to deliver great business results"
These are all real benefits, quoted in an ICF study in collaboration with PriceWaterhouse Coopers 2013. Conversations include: debriefing a project, creating better work-life balance, coaching to embed learning, creating performance objectives, exploring talents and better career discussions. The workbook regularly receives 4/5-star reviews from industry leaders and has been used by business schools around the world. 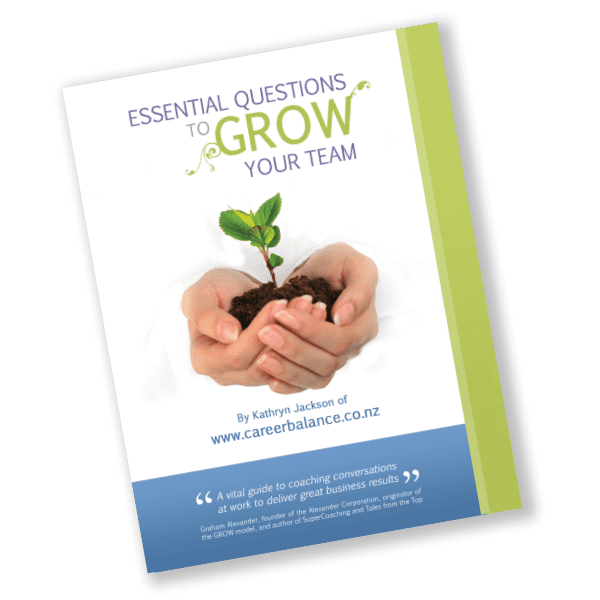 Essential Questions to GROW Your Team has been designed to give you the resources to use coaching questions with everybody in your team more confidently, where you have decided that coaching is appropriate. You can use the Conversation Guides as a framework to design your own questions, you can use them as a training tool, you can share them in advance and ask for your team to decide what they'd like to talk to you about or you can use them for your own self-coaching (like a reflective thinking framework). Many of the conversations can take place in 10 minutes or less. The Free Preview includes details for a free download of three questions per front page. To purchase your copy please click your preferred link below or contact me directly for orders of more than 20 copies.